After five days of tournament poker, the first stop on the fifth season of the EPT tour is in the books. Some 619 hopefuls put up the € 8,000 buy-in for this event, all with their sights on a championship. 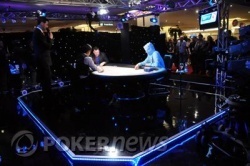 Despite the slow and player-friendly structure of this event, the blinds and antes eventually pushed the action at this final table and the result was some entertaining and dramatic theatrics. From exciting two-outers, to a classic “chip and a chair” type comeback, there was no shortage of action en route to the championship. We watched as the starting chip leader found himself being the first player eliminated and American Jason Mercier came up short in his quest for his second EPT title. In the end, it was Sebastian Ruthenberg, a professional poker player from Germany, who earned the EPT championship trophy. Ruthenberg emerged as the chip leader very early in the tournament on Day 1b and finished that day as the leader. He has hovered near the top of the leaderboard ever since. Ruthenberg, along with roughly half the players at the final table, enjoyed the chip lead on at least one occasion today, but the young German finished with it. 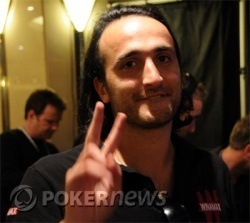 He adds an EPT title and € 1,361,000 to his already impressive tournament resume. We hope you have enjoyed our live coverage of the 2008 PokerStars.com - EPT Barcelona Open as much as we have enjoyed bringing it to you. The next stop for the PokerNews team is in just a few days when we head north to the UK for the World Series of Poker – Europe (9/19-10/02.) Until then, good night, and good luck from Barcelona! It only took three hands of heads-up play to arrive at a winner, Fintan Gavin moving all in preflop and Sebastian Ruthenberg making the call. The flop hit Gavin, coming down , but the turned, pairing Ruthenberg, but also giving Gavin more outs with a flush draw. The river, though, was the , making Ruthenberg two pair and sealing up the title for the young German. 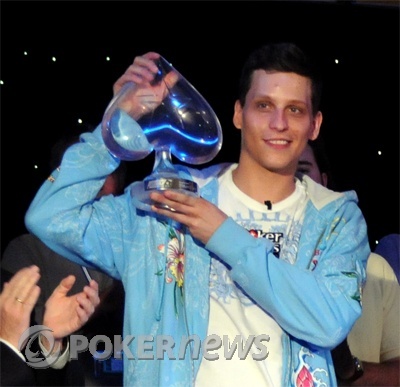 Congratulations to our newest EPT champion, Sebastian Ruthenberg who goes home tonight € 1,361,000 richer. Fintan Gavin will take € 792,000 back to Ireland for his runner-up finish. Here are the chip counts as we enter heads-up play. Sebastian Ruthenberg moved all in from the button, Davidi Kitai called all in from the small blind, and Fintan Gavin open-folded from the big blind. Kitai turned up , two of his outs dead, while Ruthenberg tabled . The flop was , Ruthenberg's fours still leading. The turn was the , Kitai picking up a gutshot straight draw, but the fell on the river, ending a hard-fought tournament for Kitai. For his performance here in Barcelona, Kitai will collect € 455,000. On the first hand back after the break, Fintan Gavin made up the small blind and Sebastian Ruthenberg checked his option in the big. On the flop, Gavin led out for 140,000 and Ruthenberg called. 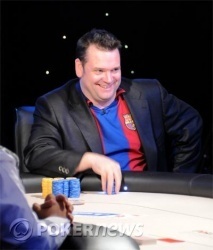 Both players checked the turn before Gavin check-raised Ruthenberg's bet of 220,000 to 600,000 on the river. Ruthenberg said, "All right" and made the call. "Good call," replied Gavin, as the German took down the pot with . Ruthenberg is now your new chip leader. The three remaining players have just gone off on another 10-minute break. At this stage, with just over 60 big blinds in play, the three remaining players are simply trading blinds and antes. Hand after hand of "raise and take it" is the best way to describe the current action. While it goes without saying, it will only be a matter of time before someone picks up a premium hand and makes a stand.